This was Mocassin's debut. She had a big class to contend with but she was a very good girl. She is one of twins that were born while we were at the Iowa Horse Fair in April. The mare was 357 days gestation and we just knew she would foal while we were gone. Well she did and she had twins. 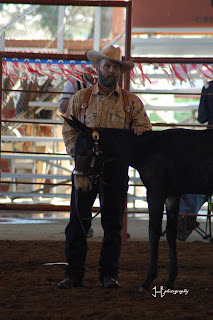 The other foal was stillborn and quite a bit smaller than Mocassin. At birth she was the smallest colt we've had at 35". She was fun to get started. Bill is having a hard time chosing between her and Jane. This is a recent picture of Jane. She has such a wonderful personality and is very respectful. She is a full sister to Angel. The mix between our jack and their mother is a good one. We've had three colts from this mix and they are exceptional mules. Very loving animals. Sooooo..... which one do you like better? Both sound and look good to me, but I've always had a liking to the dark bays. It's hard to judge by a photo.... You have Mocassin all cleaned up and groomed for her class. 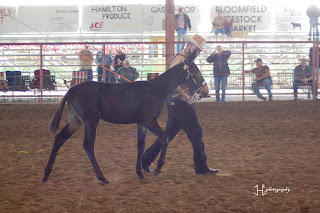 It also depends on just what someone is looking for in a mule...good looks, disposition, or both? I guess time will tell...why not start both?? We may end up doing just that. We do a lot of ground work with the colts but as far as the saddle training and riding training that goes to Sue White. Much, much cheaper than an ER visit!! It isn't the color it what is in between the ears right? I say, take the 'smartest' of the two !! Or...as I do, see which one grows on you. Thanks Val. That's the problem - they are both nice colts but I think personaltiy wise and handling Jane is the one. She is very smart and very independent. She spends most of her time with the big mules and mom is out eating. Jane is a full sister to Angel. She just comes and finds you! !